Apply for pattern design, grading and marker in garment industry. Can design pattern and grading in computer or digitizing existing patterns into computer, including grading existing patterns. Can work with Supernest. There are 2 modules in RP V10.0, including DGS and GMS. Customized Interface and User-defined toolbar can be set. Designer can set their own suitable working theme toolbar and design their own user interface. It can be Menswear, Womenswear, Children wear, underwear toolbar etc. Free Design: Designer can freely draw the pattern pieces with their own habit. Custom made formula design mode, capability for a huge library and size spec data on basic style instantly available. Allow to save and modify the existing library data, shorten the pattern work for designer. Completely solve the routine job on designer and pattern designer. Recall an existing design in DGS system, and various sizes can be created with referring to a given size table. The most important feature is linked modification: include design lines linkage,patterns and design lines linkage, transfer dart tool,move and rotate adjust tool, mirror tool and other tools linkage, adjust one part and all other relevant parts are modified together, notch, buttonhole, drill, dart, pleat and other elements can also be linked. 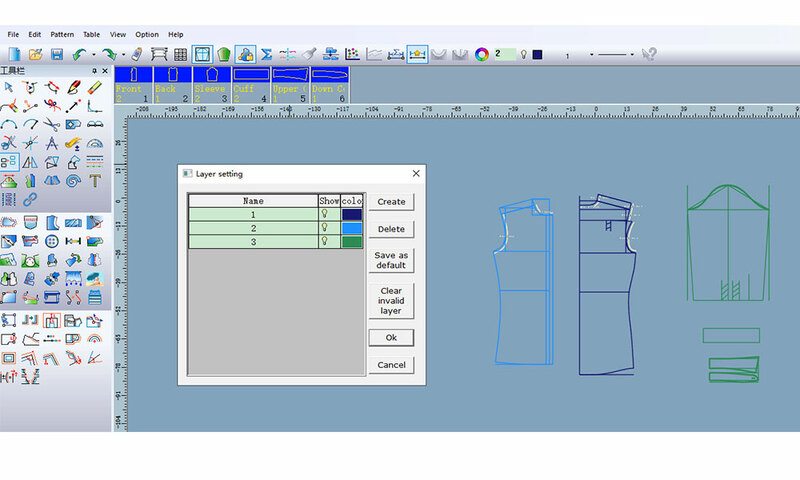 Design & Grading part keep the original garment CAD software function, it can add dart, transfer dart, add pleats and so on, it provide rich seam styles, process identification, Various customizable line types. Allows users to create their own unit library, such as collars, cuffs, etc., and load them directly when used. Grading part provide a variety of grading methods: design lines and patterns can be automatically grading,point grading, arrow keys grading, regular grading, and proportional grading, parallel grading and other special grading tools. The button, grain line, notch, drill and other identifying can be edit on the design lines in grading part. Grading part provides down content function, calculating the amount of filling of the whole piece or part,which is convenient for the down apparel company to calculate the amount and cost. Grading part provides digital input function, and the efficiency and precision of the input patterns are much higher than those of the traditional digitizer. Import other formats such as DXF, AAMA/ASTM/AUTOCAD. and mixed shading problem. It is possible to process multiple marker jobs in queue. Save time and improve productivity. Manual nesting, flexible sloping the patterns, fine-tuning and good utilization of fabrics. GMS tailor-made cap function is used to toys, gloves, underwear, etc. Copy, inverted truss function to achieve a high utilization of the fabric. GMS can read various HPGL files successfully, import the plot files of HPGL and the cutter format files and re-nesting. GMS can be expected to quickly calculate the amount of cloth used and the number of pieces to be cut,increase production efficiency, increase control over the market, and save time and money! The system supports nesting and cutting of the inner contours, connecting with output devices, printing small samples, drawing and cutting 1:1 patterns. Supernest is international innovative technology. System can automatically finish one lay of marker in a very short period, the fabric utilization can be or even higher than the manual nesting. Specially prevent the horizontal & vertical shading, and mixed shading problem. It is possible to process multiple marker jobs in queque. Save time and improve productivity. Rotation and flip restrictions according to fabric.